The AzAR Pronunciation Trainer is the computer program for working through the training units. perception: only mistakes that have been identified can be prevented cognisantly. evaluation: to decide what is right or wrong, the student has to develop a feeling for the target language and for the tone colour of its sounds and speech melody. production: the student learns how to use his/her speech organs to achieve specific results. As these functions give an objective and reproducible feedback, they can even support native speakers in improving their pronunciation. The link between the training units and their presentation in the pronunciation trainer are templates. These arrange the feedback tools and define a uniform user interface with interaction components for each exercise. The user profile is the place where the work status of the lessons, the evaluations received and the overall learning progress are stored. 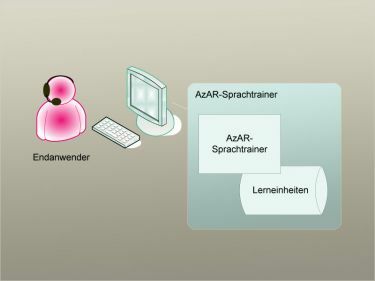 See the pronunciation trainter in action and watch the AzAR demo videos.